Feelings about the economy are mixed news for all of Canada’s major political parties right now. 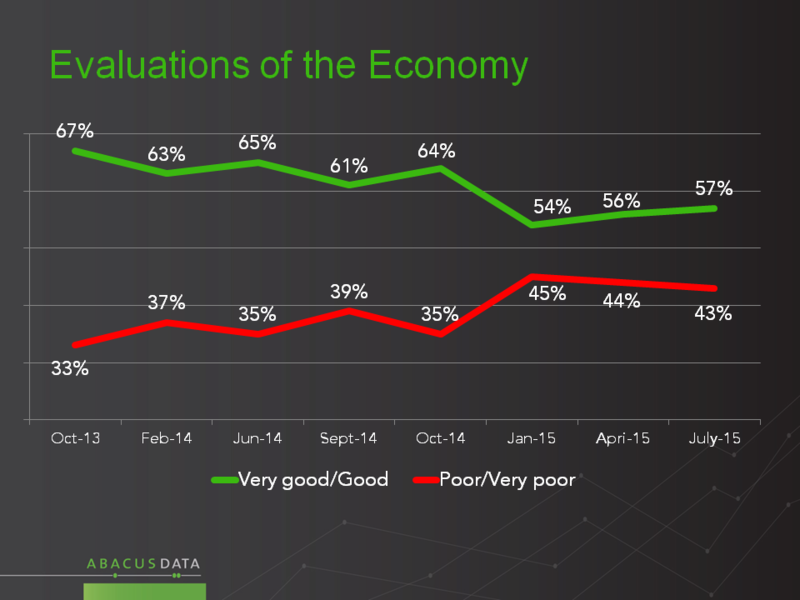 57% say the economy is good/very good, 43% rate it as poor/very poor. For the Conservatives, it is better that a majority see the economy as fairly healthy, but a challenge to realize that many people who support other parties do so despite feeling the economy is in good shape: 49% of NDP voters, and 56% of Liberal voters give the economy a good rating. Clearly, many think a healthy economy is not a function of Conservative policy, or would be no worse under a different administration. Would a different government do better or worse? • Fears of what would happen if the Liberals or NDP won are limited right now. Fewer than a third of voters think a change in government would make things worse on any of 7 issues. • When it comes to economic growth, 30% say the NDP would make things better, 25% say the NDP would make things worse, and 49% say things would be no different. The numbers for the Liberals are similar. 28% say a Liberal government would mean a stronger economy, 25% weaker, and 47% no different. 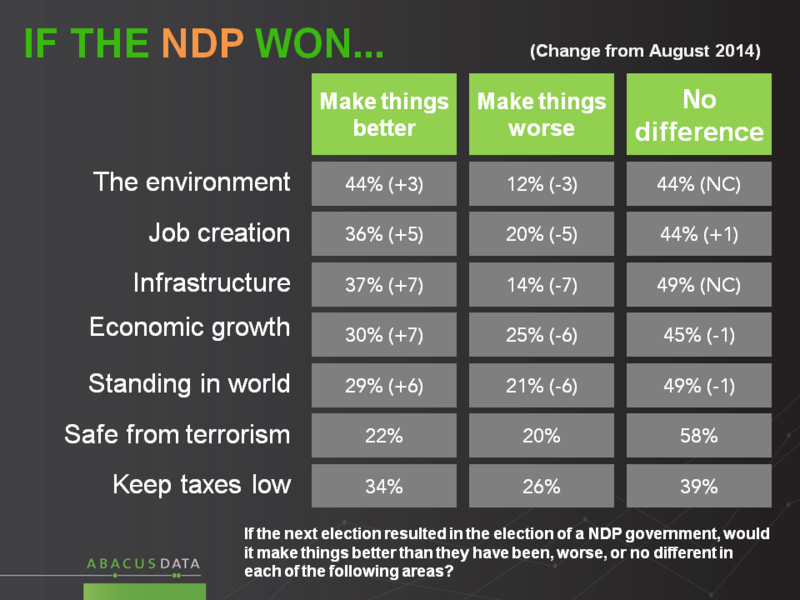 • On job creation, 36% say the NDP would make things better, 31% say the Liberals would. 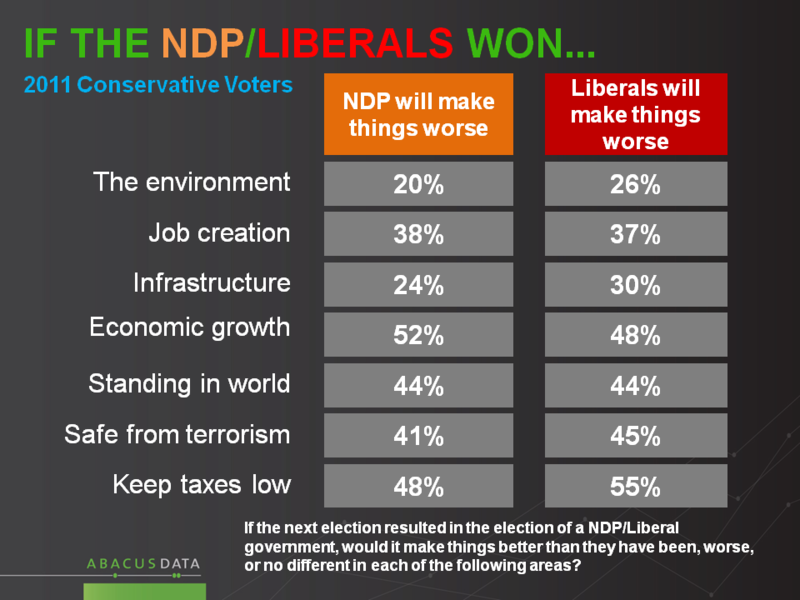 Just 20% say things would be worse under either a Liberal or an NDP government. • On infrastructure, only 14% think an NDP government would be worse, 37% better. Only 17% think a Liberal government would be worse, 30% better. • On the environment, 34% say the Liberals would make things better, only 17% said it would be worse. For the NDP, 44% say things would be better, 12% worse. • On keeping Canada safe from terrorism, only 20% think an NDP government would make things worse, only 23% think that about the Liberals. • When it comes to Canada’s standing in the world, 31% say a Liberal government would make things better, only 21% worse. For the NDP the numbers are almost identical, 29% better, 21% worse. • On taxes, 32% say the Liberals would make things worse, 26% say the NDP would make things worse. Of the 7 items tested, this is the topic that most works in favour of the incumbents. Among those who voted Conservative in 2011, fear about a Liberal or NDP government are smaller than might be expected. Only about half think the economy would worsen, only a little over a third think a change would be bad for job creation. The Conservatives have labored to persuade voters that a change in government would weaken Canada’s economy, cost jobs, lower Canada’s standing in the world and increase the danger of terror attacks. These numbers suggest that much of this effort has been ignored or discounted by voters. The number of people who believe a change in government would make things worse is generally lower than the number of people who intend to vote Conservative. The only argument that gets close to the level of agreement that could help produce a Conservative win is about taxes. Currently, interest in change is high, in part because the fear of its consequences is quite limited. A key question is this: if people haven’t come to fear change yet, can they be convinced to? If not, a new approach will be needed by the incumbents. Our survey was conducted online with 2,000 Canadians aged 18 and over from July 3 to 6, 2015. A random sample of panelists was invited to complete the survey from a large representative panel of Canadians, recruited and managed by Research Now, one of the world’s leading provider of online research samples. The Marketing Research and Intelligence Association policy limits statements about margins of sampling error for most online surveys. The margin of error for a comparable probability-based random sample of the same size is +/- 2.2%, 19 times out of 20. The data were weighted according to census data to ensure that the sample matched Canada's population according to age, gender, educational attainment, and region. Totals may not add up to 100 due to rounding.